When checking the paper to find out if any good horror films are out at the weekend, the last thing anyone expects to see is one called ‘When Office Chairs Attack!’ Although, after triffids, giant apes and blobs of unnameable substances, perhaps office chairs are a viable villain. Perhaps instead of giant squid or crazy Asian fellows, we should be watching Bond fighting off a battalion of office chairs all intent upon giving him chronic back pain before he reaches 50! 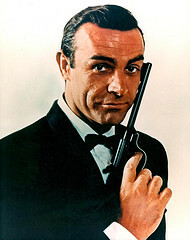 Imagine, 007 being felled by a simple item of furniture. OK, it may sound a little ridiculous, yet the truth is that office chairs do more damage to more people than giant squid have ever done. Is My Office Chair Out To Get Me? Unless your office has recently been revamped by an expert in ergonomics, the answer to the above question is most likely yes. If you spend long hours sitting in the same chair every day without perfect posture, regular breaks and plenty of stretching, then your chair will be doing you damage. Even if you don’t yet suffer from any form of back pain, chances are you are putting pressure on your back, neck and shoulder muscles and the discs and vertebrae in your spine on a daily basis. With pressure that constant, something has to give, and in this case it’s likely to be the health of your back. How Do I Defeat The Evil Chair And Save My Innocent Back Muscles? To triumph over the evil office chairs trying to destroy your back, you must do two things: 1) Teach yourself to sit properly in a way that alleviates pressure on your back; and 2) Get rid of your out of date chair and replace it with an ergonomic alternative. There are several options on the market that offer a variety of different support options. For example, many office workers are now choosing to sit for all or part of the day on a giant exercise ball. This forces the body to maintain a good posture, as if you slump you will fall off. It also promotes active sitting, where you keep the muscles moving throughout the day. Saddle chairs are literally shaped like a horse’s saddle, and encourage good posture whilst raising you higher than a regular chair, which can help you get yourself in optimal position in relation to your desk. Kneeling chairs take pressure off the spine, and upright standing workstations don’t allow you to sit at all, which although tiring at first is far better for your overall health. By ensuring you have the right chair for you, taking regular exercise both at work and in your free time, sitting correctly and stretching, you can successfully defeat the evil office chair that is trying to take your spine. Now sit back and relax… but not too far back! This post was written on behalf of Chairoffice.co.uk – leading office chair suppliers. This post has reminded me that it’s time to get away from my desk and back to my treadmill. My lovely plastic treadmill shelf (only $40) holds my laptop and allows me to work while I walk at a slow pace. Of course, I also look like a dork, but at least I’ll be a healthy dork. Hahahaha quite an invention there. Even if a bit dorky. 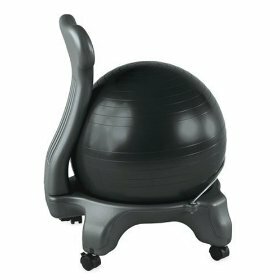 If it makes you feel any better we have a colleague who skips the whole “chair” thing and sits on a literal exercise ball. Whatever works, right?! I bet that guy/girl is the most ripped ‘whatever the hell it is that you do’ person in the whole office, right? Seriously, what do you do man? I may have read it somewhere but I’ve already forgotten. Sorry. 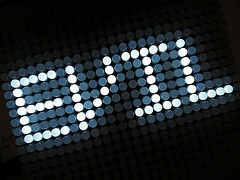 I’m an Online Marketing Specialist by day, specialising in online marketing. And the colleague was, in fact, ripped and capable and kicking all of our asses. I’m afraid of her. You know, I did have my doubts about whether an online marketing specialist actually specialised in online marketing… Thanks for clearing that up man. I’m glad my redundant explanation was seen as needless and unnecessary!